WRS Photography- On Location Family Portraits. 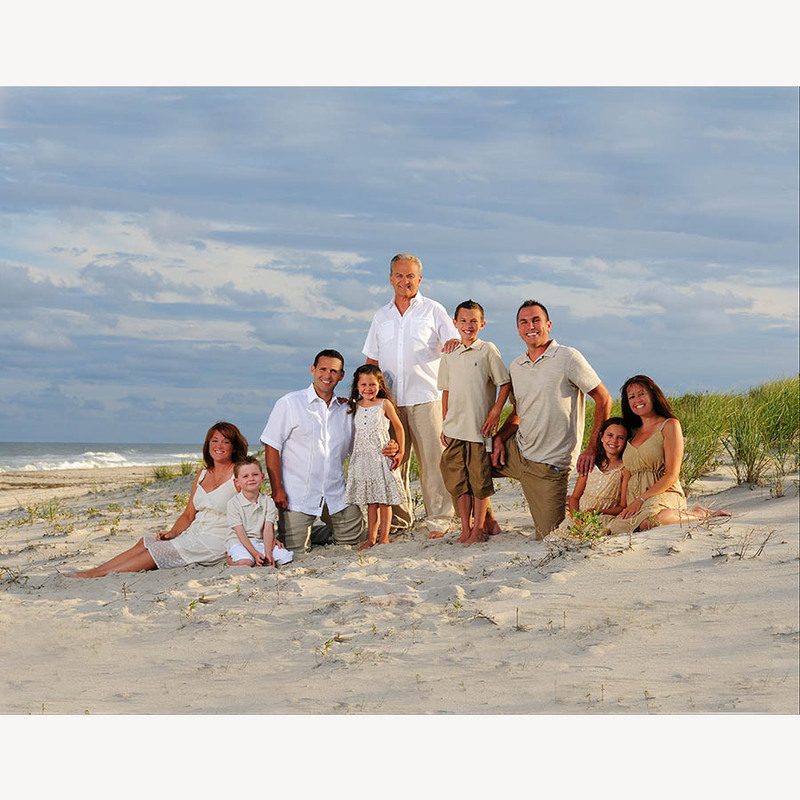 We are the Jersey Shore Beach Portrait specialist. Look for us on the beach in Ocean City or LBI. We love large groups and family reunions. All images and content © WRS Photography-Hightstown, NJ. All rights reserved. If you are a photographer or have a photography related website looking to do a photography link exchange see our resources/links page for more details. WRS Photography is an on location full service mobile photography studio based in the Princeton, New Jersey region. Being Based in Central Jersey it allows us to quickly travel throughout New Jersey Including several of New Jersey's fine beaches including Ocean City, LBI, Beach Haven, Surf City, Point Pleasant, Margate, Ventnor, Avalon, or Longport. Photographer Bill Solvibile prides himself in his love of family portraits. On Location Portraits of children and their families can be a challenging task but our photographer finds a unique approach to shoot. Our Family photographer takes his time to ensure that you are never rushed. This is one of the reasons he choose to take on location family portraits and beach portraits. By moving out of the studio and to a location of your choice it allows the client a relaxed environment of their choosing which they are familiar with. This results in beautiful portraits which you will treasure for years to come. We pride ourselves in our ability to create wonderful and unique beach portraits. We are considered the Jersey shores' premier beach photographers. On Location Beach Portraits are a great way to get the family together for a relaxing fun time. Family Beach Portraits are typically taken in the evening, during the last two hours of daylight. This is when the lighting is optimal to create beautiful beach photos of your family. In a typical session our photographer will start by photographing your entire family, often an extended family. We will take several shots in a few different locations. After that we will break the group up and shoot individual family portraits, get a shot of all the grandkids together with their grandparents, maybe even take a few couples engagement beach portraits. Basically we will shoot every combination you wish for. At WRS Photography we only shoot one one family a day so you will never be rushed. Although we specialize in children's portraits, family portraits and New Jersey Beach portrait. We also do a number of babies portraits, newborn portraits, Christmas Portraits, families portraits, engagement portraits, and Beach Portraits in your home in Central NJ, Mercer, Monmouth, Bucks County, Princeton, Freehold, Yardley. As a kids photographer I take the necessary time with your child, toddler or baby to allow them to get comfortable with their children's photographer. Being a mobile studio means that today I could be a Cranbury photographer, tomorrow a Princeton Photographer, and the next day a Freehold photographer. In the summer I am often on the beach working as an LBI Photographer, an Ocean City Photographer, a Margate Photographer, or an Avalon Photographer. We will travel to do beach portraits in all of the new Jersey beaches including Bradley Beach, Belmar, Point Pleasant, Manasquan, Bay Head, Manteloking,Lavallette, Seaside Heights, Seaside Park, Barnegat Light, Harvey Cedars, Surf City, Ship Bottom, Beach Haven, Brigantine, Ventnor, Margate, Longport, Ocean City, Sea Isle City, Avalon, and Stone Harbor. We offer both color portraits, black and white portraits, and sepia portraits. Every client will see examples in their proof gallery. If you like the black and white beach portraits we can show you more. We love to capture couples and prepare their engagement shots. On Location engagement portraits of couples is very special. I like to incorporate something unique to the couple in their shot. I always ask couples to bring some personal item to incorporate into their photo session. Perhaps just let me photograph you on a picnic or photograph you on the beach.